The spectacular last to first win by Castelvecchio in the inaugural Millenium and Nature Strip’s demolition job on the opposition in the Rubiton Stakes dominated the headlines last week. Image courtesy Bradley Photographers - Red Dubawi was one of Chad’s four winners at Newcastle 02/02/2019. In recent years healthy riding fees and percentages generated by increased prize money have provided an incentive for industrious jockeys who are prepared to travel. Lever has carved himself a nice little niche on the NSW country and provincial circuit since making the move from SA just over five years ago. Image courtesy Bradley Photographers - Chad has been unsaddling winners on a regular basis lately. He was born and reared in Port Augusta, where his late grandfather Fred Brodie had been a jockey and a trainer. “I obviously inherited the racing genes from grandad”, said Chad over the weekend. “He was a great horseman and taught me all of the fundamentals. I heard his old racing yarns many times over and loved them all”. Chad began riding work for Fred Brodie around age twelve, continuing into his early teens. It was his grandmother who recognized enough natural talent to warrant a phone call to Leon Macdonald in Adelaide. “Leon had more apprentices than horses at the time and really didn’t need another one”, recalled Chad. “Grandma must have been a good talker because he finally agreed to sign me up”. The aspiring jockey was quickly disillusioned when he worked out the “pecking order” at French Cotton Lodge. Number one was the talented Jason Holder, still among Adelaide’s top jockeys. Number 2 was Matthew Paget, now one of the busiest riders in northern NSW, and Kathy Brown who went on to great success in South Australia. Chad couldn’t see himself getting a ride in track work, and a race ride looked to be light years away. But as is so often the case in racing, a bizarre twist of fate changed everything. “Jason Holder broke his arm, Matthew Paget sustained a nasty knee injury and Kathy broke her pelvis”, recalled the jockey. “I went from number four to number one in a matter of weeks”. Through the misfortune of others, Chad Lever’s career took off. He outrode his claim in eighteen months and the rides were coming from everywhere. “Leon Macdonald was very good to me”, said Chad. “He was a great mentor, a great boss and a wonderful friend”. Image courtesy Bradley Photographers - Chad with the yellow cap, wide out, gets up to make it four for the day at Newcastle 02/02/2019. His mount is Alnaas for trainer Joe Pride. The young jockey was thrilled to be given two race rides on the stable star, dual Group 1 winner Umrum. The hardy gelding retired as a nine year old in 2004, with a record of fourteen wins and twenty placings for $1.6 million in prize money. “I finished unplaced on him in the Spring Stakes at Morphettville in 2002 and rode him in his final start at Victoria Park more than two years later”, recalled Chad. “It was a privilege to sit on his back”. Chad didn’t get to ride Gold Guru in a race, but partnered the chestnut in trackwork many times. Gold Guru was a great ambassador for the Macdonald stable, recording eight wins and eight placings for $2.4 million in prize money. He was dynamic in the autumn of 1998 winning the AAMI Classic, the Australian Guineas and the Ranvet Stakes defeating Might And Power. He then had no answer to the older Might And Power in the Mercedes Classic, but bounced back to win the AJC Derby beating the great horse Tie The Knot. After winning two junior premierships in Adelaide, young Lever linked up with the strong Richard Jolly stable and promptly won two jockeys premierships in his home state. Some time later Chad was forced into having a knee reconstruction, which kept him out of the saddle for six months. When he finally got back into action he was riding winners without setting the world on fire. He was needing a change and was first to put his hand up when Sam Kavanagh indicated his intention to set up a Sydney stable. Kavanagh was the trainer to get the Chad Lever show on the road in Sydney, with Bjorn Baker also quickly recognizing the talents of the South Aussie. “Bjorn put me on several winners including my favourite Miss Tenpins”, recalled the jockey. “I won four straight on the mare at Bathurst, Orange, Nowra and then a Canterbury night meeting”. 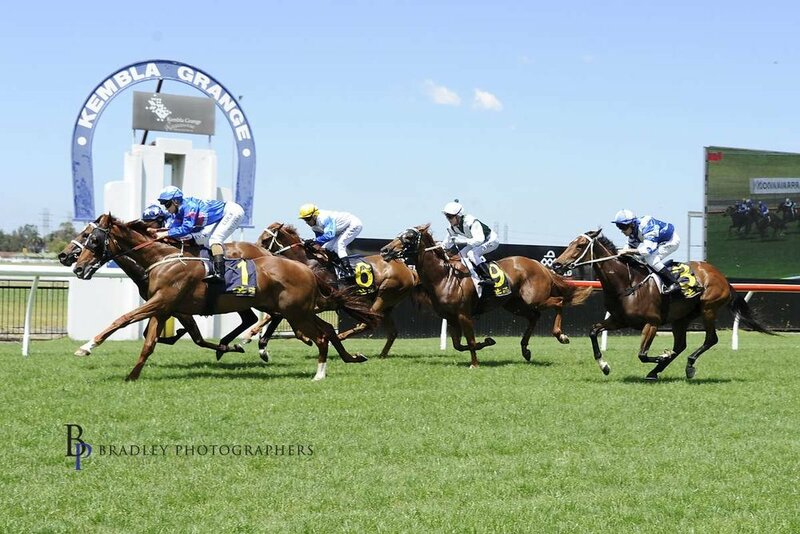 Image courtesy Bradley Photographers - Miss Tenpins helped Chad to get going in Sydney, with four straight wins including this one at Canterbury in 2013. It wasn’t long before C.Lever’s work ethic generated a strong clientele. He was travelling to a lot of meetings on the provincial and country circuit and the winners were flowing at a very healthy rate. It was around this time that his friendship with fellow jockey Claire Nutman blossomed into romance. Claire, daughter of Hawkesbury trainer Richard Nutman, recently announced her retirement from race riding having ridden 120 winners. During her short career she was immensely popular with Hawkesbury trainers who provided the bulk of her opportunities. Just over two years ago, Rosehill trainer Tim Martin prepared one of Claire’s most significant winners. Claire rode a perfect race on Sea Sharp, to scramble home narrowly from Too Quick For You in a Class 1 race at Kembla Grange. The runner up was ridden by Chad Lever, who rarely mentions the race. Image courtesy Bradley Photographers - Claire gets Sea Sharp home by a whisker from Chad’s mount Too Quick For You at Kembla in 2016. Nowadays Claire enjoys riding work for her father Richard and occasionally gets her partner to help out. “Dad has a few two year olds in work this year and being a part of their education is very rewarding”, said the former jockey. Claire currently has a full time role as Chad’s chauffeur. She drives him to his many country and provincial assignments, lending a sympathetic ear on the way home if needed. Claire was with her future husband in August 2017, when he had a nasty fall at Scone. Image courtesy Bradley Photographers - Claire is all smiles after winning on the Wade Slinkard trained Stradazzle at Hawkesbury. Chad incurred multiple injuries when his mount Anticipate crashed to the turf while racing near the tail of the field. He sustained concussion, facial fractures, a hand fracture and a deep wound above one eye. The jockey was helicoptered to the John Hunter Hospital at Newcastle where he kept doctors busy for a few days. “I was shattered that this could happen at a time when I was really getting a foothold”, reflected the jockey. “The injuries were pretty nasty, keeping me out of action for five long months”. Claire was by his side during the first worrying week in the John Hunter Hospital and remained a source of inspiration throughout his rehabilitation. Chad has been back in action for almost a year. He has slowly rebuilt his client base, with a few new ones to boot. There’s no doubt he’s one of the most sought after jockeys on the “out of town” run, providing his longtime manager Andrew Northridge with a few headaches. Melbourne based Northridge, managed the jockey in the Adelaide days and was happy to continue in the role when his client moved to Sydney. Chad’s name will be missing from the riding ranks at least once in the month of June. His bride to be is currently working on an appropriate date for one of racing’s most anticipated weddings. In the meantime Chad Lever hopes to maintain a run rate which would put him right up there with Australia’s most successful jockeys for the month. Ten winners in eight days in the week just gone. Might get close to twenty by the end of February. Even William Pike will struggle to top that! 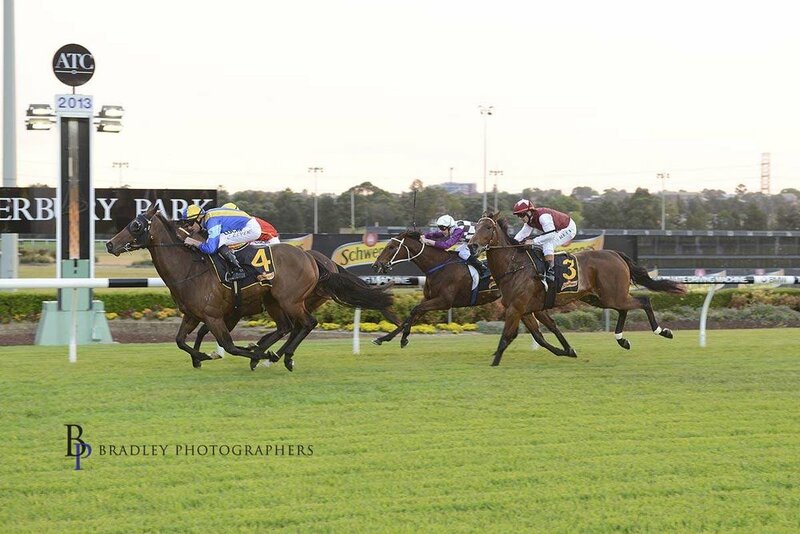 Image courtesy Bradley Photographers - Chad gets D’argento’s career started in a 2yo maiden at Newcastle.